Police in the Pakistani city of Karachi fired tear gas to disperse residents protesting over their handling of a double murder, officials said. 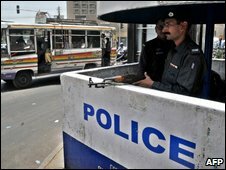 Two brothers from the Bengali immigrant community in Karachi were killed while resisting a robbery on Monday. Residents stormed a police station after police refused to register the incident saying the scene of the crime lay outside their jurisdiction. The clash occurred in a poor area where anger against the police runs high. Witnesses said that people stormed the Landhi-4 police station late on Monday night when officials there refused to register a complaint about the murder. Police officials at the neighbouring Sharafi Goth police station also refused to deal with the complaint, arguing the area in question fell within the Landhi-4 jurisdiction. After shuttling between the two police stations, protesters turned violent, pelting parked vehicles with stones and burning tyres on roads. They also damaged some police vehicles parked inside the Landhi-4 police station, witnesses said. The police used batons and teargas shells to disperse the protesters. The brothers, both belonging to the Bengali immigrant community, were killed when they resisted robbers at a local market earlier on Monday.